Still from Ben Hur (1907). The film is noteworthy as a precedent in copyright law. The movie was made without the permission of the author's estate, which was common practice at that time. The screenwriter, Gene Gauntier, remarked in her 1928 autobiography how the film industry at that time infringed upon everything. 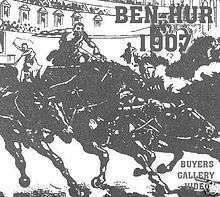 As a result of the production of Ben Hur, Harper & Brothers and the author's estate brought suit against Kalem Studios, the Motion Picture Patents Company, and Gauntier for copyright infringement. The United States Supreme Court ultimately ruled against the film company in 1911. This ruling established the precedent that all motion picture production companies must first secure the film rights of any previously published work still under copyright before commissioning a screenplay based on that work. The film was directed by Canadian director Sidney Olcott. At fifteen minutes long, only a small portion of the story was put on screen. The focus of the piece was the chariot race, which was filmed on a beach in New Jersey with local firemen playing the charioteers and the horses that normally pulled the fire wagons pulling the chariots. In 1908, perhaps seeking to capitalize on the publicity of the case and the film, Harper & Brothers published a lavishly designed and illustrated book, The Chariot Race from Ben-Hur, which excerpted only the race from Lew Wallace's novel. Accompanying the text were color illustrations by Sigismond Ivanowski. Actor William S. Hart, soon to be a famous silent film cowboy, reprises his role as Messala from the 1899 Broadway premiere and 1900 season Broadway play. 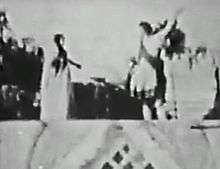 Herman Rottger is Ben-Hur against Hart's Messala (in the 1900 play William Farnum, another soon to be famous silent cowboy, portrayed the character). Wikimedia Commons has media related to Ben Hur (1907 film). Google Book Search file on the case Harper & Brothers v. Kalem Company (1909), from the book Select Cases on the Law of Torts, by John Henry Wigmore.